Stan Loh wrote this song inspired by a TV program about Diane Rose. A totally blind quilter who is a great inspiration to us all and motivates people to get the best our of their lives. 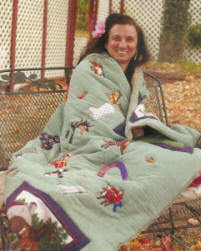 You can read about her on http://www.theamazingquilter.com/ Don't miss the youtube video on that page. It moved me when I saw it.